Living like a pirate is tough work. But just because the grog is bad, the food is worse, and your shipmates are as likely make you walk the plank as they are to say hello, it doesn't mean you have to dress like a scurvy-riddled sea urchin! Dress up in this Plus Size Burgundy Pirate Wench Costume, and you'll have that sassy, chic buccaneer look you've been wanting for all of your pirating exploits! There are other reasons to don a stylish outfit while sailing the Seven Seas than just looking nice. Like in any job, you want to dress professionally when you go to work. So, wearing a fine quality dress while pillaging a merchant ship for its cargo will leave a much better impression than if you were wearing filthy, tattered rags. You might be surprised how quickly word travels on the open ocean, and if you're wanting a reputation for being a fearsome, unstoppable pirate, wearing some dashingly recognizable attire will help make that happen. On top of that, this lacy dress breathes a lot better than the heavy leather and wool garb most other sea dogs are tromping around in, which will definitely come in handy if you decide to set sail in the balmy, humid tropics! Lace also helps you look like one saucy lass, and the burgundy skirt and intricately designed bodice give this ensemble a bold flair. 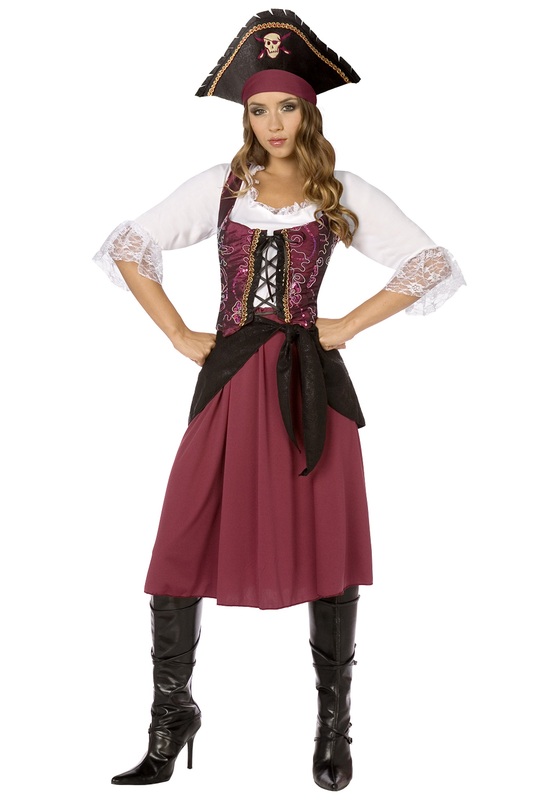 The hat and sash complete this swashbuckling look, so you just need to add some fierce boots and a sword. Then, you'll be ready for any pirating job that comes your way, no matter how tough it gets!